Advance analyses are carried out on the impact on the flora and fauna in each location where the Company plans to operate. Assessments must cover the 4 seasons (spring, summer, autumn and winter). Assessments are carried out in two areas, the ecology and the landscape, and enable the project to be oriented and adapted according to the items under assessment. Once the project has been carried out, depending on the type of impact study, suitable defence areas are set up to preserve the species in the location. A monitoring committee is set up and carries out regular inspections on the ground to ensure the actions undertaken are appropriate. The first analysis involved the building of the Plan Joran telecabin. Several analyses are currently being carried out at Balme for the next Charamillon telecabin (scheduled for 2017) and at le Brévent for the replacement of the Parsa chairlift (scheduled for 2015). The research unit’s role also includes what already exists, with historical studies of the evolution of the landscape. It is an essential tool for the Compagnie du Mont-Blanc’s environmental policy. In 5 years, the Compagnie du Mont-Blanc’s waste treatment has increased from 150 to 400 metric tons at the end of 2014: an increase of 266%. This treatment involves actions organised by the Company such as the recycling of 238 metric tons of metal, 70 tons of wood and 16 tons of paper and cardboard. It also involves individual initiatives such as the collection of plastic bottles from restaurants or the rubbish bins at les Grands Montets last winter, instigated by Marc SORIANO, an employee of the business. This operation enabled 3 skips or 1 metric ton of plastic to be collected which was recycled by a specialist organisation. At the beginning of the winter season, 6.24 metric tons of metal which had been stored around the site was removed from la Flégère. Equipment already on site was used to bring the material to the bottom of the Flégère cable car before it was removed for recycling by the operator. 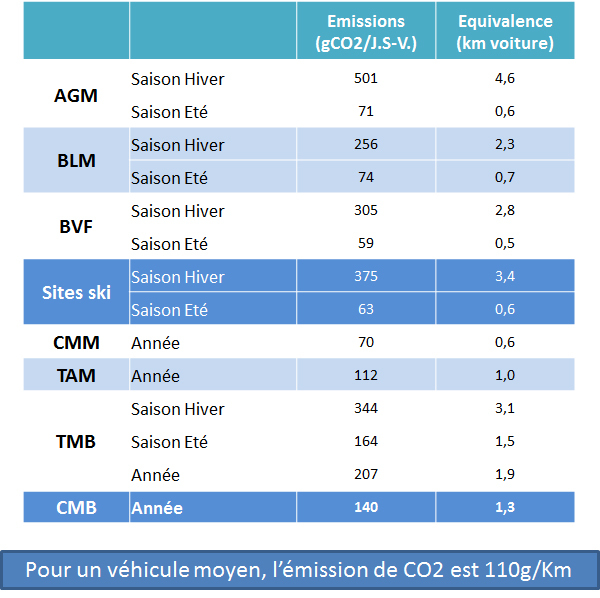 Since the winter of 2013/2014 carbon data has been displayed at all the Compagnie du Mont-Blanc’s facilities. The data is expressed clearly. Every skier-day (or visitor-day) is converted into a number of kilometres in a car. A new calculation is carried out at the end of the winter season and enables more ways of reducing carbon levels per location to be found. Last winter, an experiment was set up using a « green » piste-grooming machine at le Brévent. This hybrid machine made by Pistenbully was bought last autumn. Data must be analysed to find out if the whole fleet should be converted in the near future. Similarly, the Compagnie du Mont-Blanc’s vehicle fleet was studied to establish if it is worth changing over to hybrid or all-electric vehicles. During the summer, places where there are a lot of protected plants and species and where growing, reproduction and nesting zones could be set up for these species, will be identified. We are planning to show these species and zones on piste and walking maps. Everyone must play a part in protecting the environment where they live or come to recharge their batteries in both winter and summer!